March at Cottonwood will focus on artwork themed around the human form. This all-media juried show asked artists to represent the figure as a way to express a reality, an aesthetic, or a story. Pieces created explore sense of self, culture, or identity. Art depicting the human body and figure has been one of the central topics of visual art since pre-history, with the human form often considered the ideal of beauty from an aesthetic standpoint. A universal shared experience is having a body, although the ways we inhabit and experience these bodies as well as how our bodies are experienced and viewed by others vary widely. 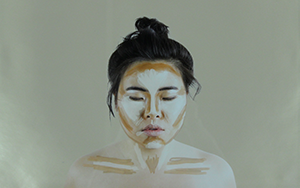 As a way to represent and understand identity and its facets, including gender, race, ethnicity, and sexuality, the body is one of the most common artistic subjects, almost universal in its ubiquity across cultures.